Broadway musical. It has been reprinted in inexpensive paperbacks, deluxe coffee table editions, and everything in between. It has been merchandised as toys, posters, calendars, and dozens of other products. It has appeared in over 2,000 papers worldwide. 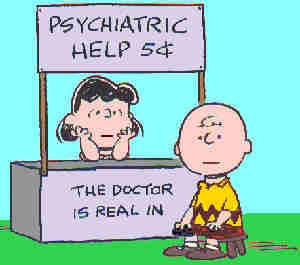 And it has made its creator, Charles M. "Sparky" Schulz, a millionaire many times over. The strip's beginnings were less auspicious. Schulz's interest in comics goes back to early childhood — in fact, his nickname comes from "Spark Plug", the name of Barney Google's horse. During the late 1940s, Schulz did a one-panel feature called Li'l Folks for the St. Paul Pioneer Press. He tried selling it to several syndicates, but was turned down. When United Feature (which syndicated The Captain & the Kids, the cartoons of Bill Mauldin and other well-known toons) bought it, they changed the name to Peanuts (a name Schulz disliked from the start), and offered it as a filler. Only seven papers carried its debut. Schulz's distinctively wide-open drawing style, characterized by simple designs and a lot of white space, was intended at least partly to call attention to a shorter than average, little-noticed feature. That wasn't all it had to attract attention. The gentle humor, with a "modern" 1950s approach, based on interactions among such finely-delineated characters as the luckless but appealing Charlie Brown, the "fussbudget" Lucy, and Charlie Brown's indescribable dog, Snoopy, quickly moved the strip out of filler status. By 1955, Peanuts had attracted so much attention, it brought Schulz the first of two Reuben Awards (the second came in 1964) — and in 1978 he was named International Cartoonist of the Year by a vote of over 700 of his colleagues, worldwide. In 1987, the U.S.'s National Cartoonists' Society inducted him into the Cartoonists' Hall of Fame. The strip followed a similar, though less stellar and less lengthy, path in comic books. Starting in 1953, reprints of the newspaper strip appeared as a sporadic filler in United Comics and Tip Top Comics, which regularly featured Nancy, Li'l Abner, Gordo, and several other United Feature strips. It graduated to every-issue status in Tip Top a year later. In 1957, new stories, written and drawn for comic books, started appearing in those titles and as back-ups in Fritzi Ritz — and one of those stories was done by Schulz himself, tho the majority were by either Jim Sasseville (who also collaborated with Schulz on It's Only a Game) or Dale Hale. Hale was the artist involved in 1958, when Peanuts started headlining a few issues of Dell Comics' Four Color Comics. These Four Color appearances segued smoothly into a separate title for Peanuts in 1960, which, first under Dell's imprint and then that of Gold Key, lasted until 1964. Peanuts was first animated in 1957, for a series of automobile commercials — but the strip's actual career in that medium began in 1965, when producers Lee Mendelson and Bill Melendez made A Charlie Brown Christmas. That half-hour special won an Emmy and a Peabody Award, and became a CBS annual tradition — as well as setting the tone for dozens of subsequent Peanuts specials, several of which won Emmys or Peabodys of their own. In 1969, Mendelson and Melendez produced A Boy Named Charlie Brown, the first Peanuts feature film. This was followed by Snoopy, Come Home (1972), Race for Your Life, Charlie Brown (1977) and Bon Voyage, Charlie Brown (1980). Peanuts entered the world of musical theatre in 1967, with the Broadway opening of You're a Good Man, Charlie Brown. The production enjoyed a five-year run in New York, and was successful on the road for a long time after that. It is still performed frequently, in many venues, and had a full-scale Broadway revival to celebrate the strip's 50th anniversary. All this, plus the usual T-shirts, lunch boxes, toys, etc. So vast is the realm of Peanuts paraphernalia, that an actual Peanuts museum was constructed, with work beginning in 2000. Schulz retired in 1999, at age 77. Rather than see the strip in other hands, he decided to end it. The final new Peanuts daily appeared on Jan. 3, 2000, and the last Sunday on Feb. 13 of that year, after which, like Little Orphan Annie and Calvin & Hobbes, it went into reruns. By that time, the strip was read every day by an estimated 355 million people in 75 countries, and was being translated into 21 languages. On Saturday, May 27, 2000 — the day of that year's Reuben Awards Banquet — Schulz's fellow cartoonists honored him in a unique way. On that day, practically every comic strip in America made a reference, of one kind or another, to Peanuts. The tribute had been intended as a surprise for Schulz; instead, it was a memorial. Schulz had died quietly in his sleep during the night of Feb. 12 — just as newspapers containing the final new Peanuts strip were rolling off hundreds of presses. Text ©2000-07 Donald D. Markstein. Art © estate of Charles M. Schulz.